Ficus Pumila in Shady Location? How do you think a Ficus pumila will go on a shady, south facing wall? I am after something that will hide a very unattractive corrugated fibre-cement fence (Old Super 66 fence). Have tried a climbing hydrangea which failed and now need to try something else .. maybe this is worth a try? How do you think a Ficus pumila will go on a shady, south facing wall? I am after something that will hide a very unattractive corrugated fibre-cement fence (Old Super 66 fence). Have tried a climbing hydrangea which failed and now need to try something else .. maybe this is worth a try? Sorry to have to tell you this fiona, but Ficus pumila really needs a decent amount of direct sun throughout the day. They will grow in lower light situations but just end up looking thin and as you need some serious camouflage, I'd suggest that its not a good idea. 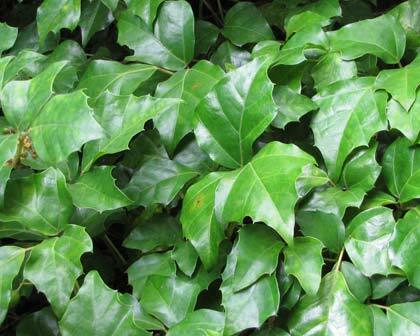 Cissus rhombifolia - Grape Ivy or Hedera canariensis - Canary Islands Ivy would be better choices. The photo below is Grape Ivy.